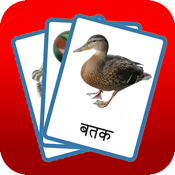 GujuGuru will help you learn Hindi using simple, fun, interactive flashcards. Great for all ages but especially designed with kids in mind. Employing the method of “see, say, and spell” used in elementary school classrooms everywhere, each card is double-sided with text, spoken audio and rich, colorful graphics. There are other Hindi apps that try to help you learn the alphabet and others that focus on just words. GujuGuru is the only one that gives you both. It combines a practical vocabulary of common, everyday words with the fundamentals of numbers, letters and vowels. There are currently over 150 cards across 9 categories: Letters, Vowels, Numbers, Colors, Shapes, Clothes, Foods, Animals, In the house. More content is included with each update. In Flash Card mode you can scroll through each card at your own pace with a flick of your finger, set it to play through them automatically or just shuffle up the cards by giving it a shake. Get GujuGuru's Quiz Pack for access to Quiz Mode - where you can test your knowledge using our highly interactive and easy to use quizzes. Fun animations, sound effects and instant feedback keeps students entertained while they learn. You can also share progress with friends and family by sending scorecards by email or posting them to Facebook. If you are interested in learning Gujarati or in using GujuGuru on your iPhone, then check out our other apps. Just search for GujuGuru in the app store.